Need more information about booking Home 9121959 ? 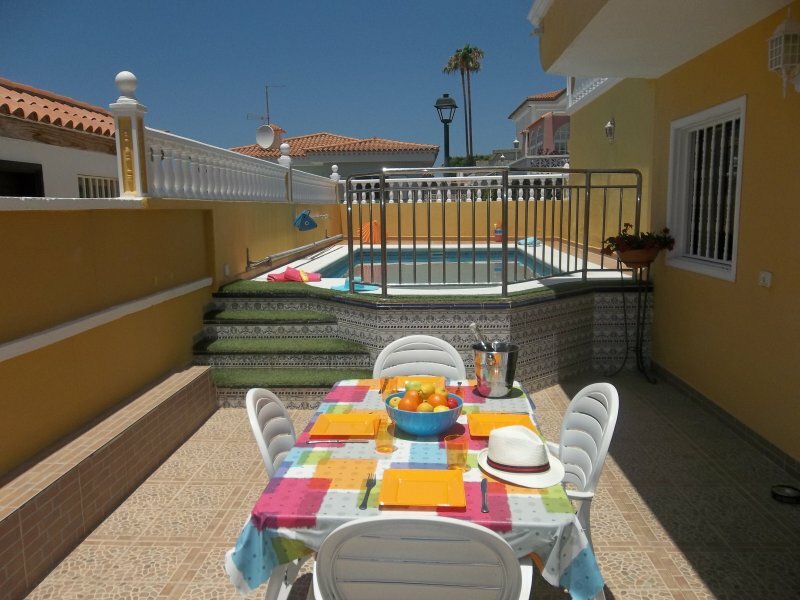 Tenerife Villas Online offers this large semi detached 2 bedroom villa with private heated pool and free WIFI. This villa is situated all on one level. You can enter the villa from the main street (no steps), into a large front private terrace with gardens. Enter the villa into the spacious Lounge/Diner with American style kitchen. The lounge offers which has a 3 seater sofa bed (sleeps 5th & 6th person) and a chair. The large 32 inch TV system has British, Spanish, German and Russian TV channels there is also a DVD player. The dining area consists of an expandable table and chairs for 6 guests, then into the Kitchen you will find a fitted kitchen with portable oven, hob, fridge, microwave, toaster, iron with board etc plus all the crockery and cooking utensils you would expect to find in a holiday home. Off the entrance hallway you will find Bedroom 1 that has a king size bed and large fitted wardrobes. Bedroom 2 has twin beds and large fitted wardrobes, both bedrooms have complimenting curtains and bed linen. There is also a large fully tiled shower room with huge walk in shower, basin and WC. Free wifi is also available at the villa. There is an outside laundry room with washing machine. Pool heating is available at £9 per night. Please pre book this. The private heated pool is a rectangle shape and approx measures 7 x 3.5 meters and 1.2 meter at shallow end and 1.60 meter at the deep end. You enter this stylish pool by roman steps. This pool is surrounded by a terrace with 4 sunbeds and table and chairs for 4. There is also part sea views. The Front terrace of the villa provides well kept gardens and BBQ for your enjoyment. If any problems emerge during your stay please ring the number in the book which will be in the apartment. The property manager is very hands on if any problems arise.